No matter what size dinner you are hosting, you can easily incorporate a nautical, coastal or sea life inspired theme into your table setting. From centerpieces, to dishes, to napkins, to serving-ware and glasses, there are so many ways to take your table from drab to fab. 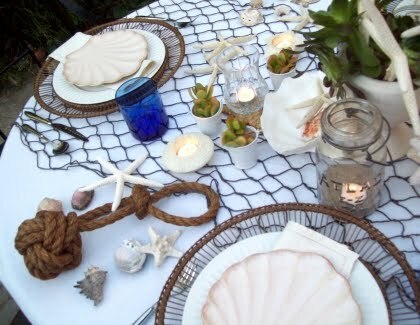 What’s great about a sea inspired theme, is that it’s timeless, and can be used at any sort of event from a backyard barbecue or clambake, to a formal sit down dinner. If you can’t be on the beach for dinner, you can definitely bring the beach to you! Going to a florist and having a custom centerpiece made for you is always an option, but can be expensive, and require preordering. I like using natural elements around the table. One quick and easy centerpiece idea is to use glass vases and candles. You can fill these vases with anything you have lying around. Think seashells, starfish, sand, driftwood, sisal rope, rocks, sea glass…use your imagination. You can also take existing glass or plastic vases and make DIY nautical rustic sisal rope centerpieces, as seen on the blog Ruffled. 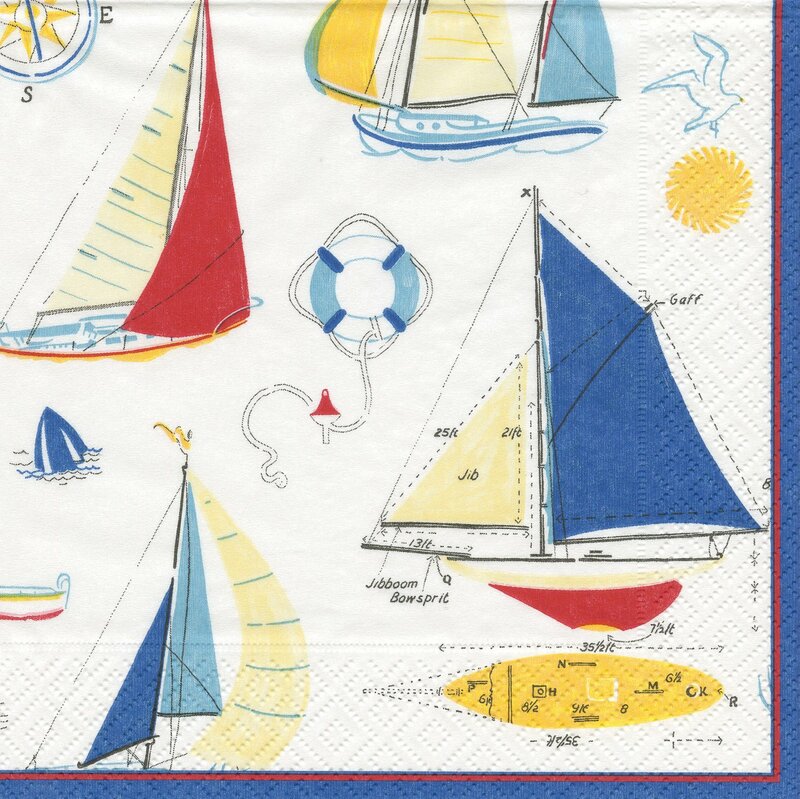 Napkins are also a fun way to bring color and carry your theme through to the table. If your event is casual, go with a disposable printed napkin, if it’s more formal, go with a linen napkin. When it comes to dinnerware, I love dishes that are embellished with some sort of sea inspired them, without distracting from the food on the plate. 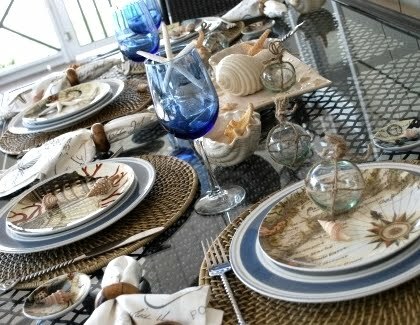 I’ve found that there is a wide variety of sea inspired plates and platters available right now. While some are ceramic, others are melanine, which is perfect for backyard barbecues. Here’s some table inspiration for you all, and links to some great accessories you will need to turn your dining table into a beautiful sea inspired gathering place for you , your family and friends! Click each photo to view the original source, or where to buy!